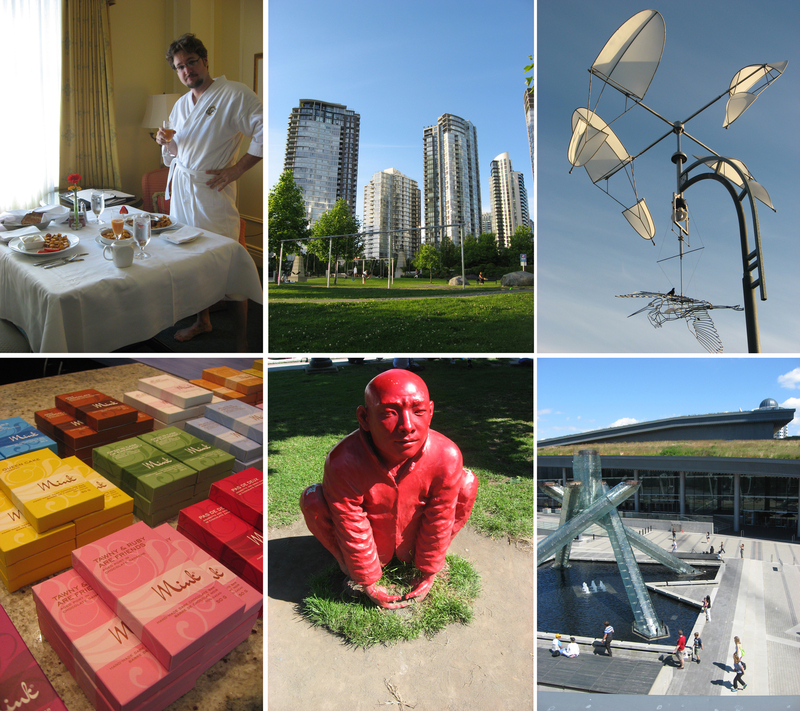 I have always taken it for granted that Vancouver, BC is ‘just right there’ – just 3 hours away, give or take – an amazing example of great urban spaces and an incredible crossroads of many international influences. Not to mention what that means as far as food is concerned! And while I used to find myself up there quite often – it had been 4 years since my last visit. 4 years! So, when my buddy Lori, with an in at fancy Fairmont Hotels, asked if we would like a little getaway to Vancouver, we jumped at the chance. We arrived on a Friday night, donned our ‘going out’ clothes and headed down Robson to Denman in search of, what a friend said, was THE best Izakaya style Japanese restaurant in Vancouver – Kingyo Izakaya (website down as of this posting – 871 Denman Street). We don’t really have a lot of this style of Japanese dining in Seattle (will have to check out Wann in Belltown and report back) – where the atmosphere is welcoming and festive with small plates to share – think Irish pub meets tapas meets excellently executed Japanese food, where they all welcome you in a unison sing-song way (above, top, left), and you are kind of getting close. Kind of. Anywho – the food was excellent as the snacks kept rolling across the table – with everything from fresh tofu (above, bottom left – a treat I had two times this visit – also a rarity around these parts), to superb yellowtail sashimi, to a Japanese take on a Cesar salad, excellent prawns, to meats, to noodles, to… well, a little bit of everything and it was all good! The sake was the perfect accompaniment and the frozen grapes were a nice final touch (above, top, middle). Oh, and I can’t forget to mention – the perfectly yummy cocktail we had across the street at the Central Bistro while we were waiting on our table! The Twisted Ginger (above, bottom, middle) – with ginger, grapefruit, lychee, and a hint of rose along with vodka – it was lovely. Our Saturday began, with the lovely lingering perks of the Fairmont Hotel. The pool and the sauna both were wonderfully relaxing – but the real treat was the room service breakfast – who knew a table full comforting food being rolled into your room, while you stay robe-enveloped, could make for such a lovely time?! (okay – all those folks that stay at that type of place regularly know this – i.e. not really me…). After a fair amount of lounging had been had, we met up with Lori and Brian for some wandering in the city, and a to-do list that included items such as: lay in grass and watch clouds (check), test out some swings (check), peruse public art (check), chocolate tasting at Mink (bottom left – check) stare at the water from as many park-like vantage points as possible (Vancouver has many – but, check). The new convention center is great piece of public work for all you archi-types who haven’t been since the Olympics (above, bottom right, with Olympic cauldron in front). We ended this lovely day over a lingering meal at the Fairmont Hotel Waterfront’s Herons West Coast Kitchen – a tasting menu for the rest of the table was heavy on the meats, so I happily focused on the Salmon edamame bi bim bap. Huge portions were a surprise, and there were many leftovers. 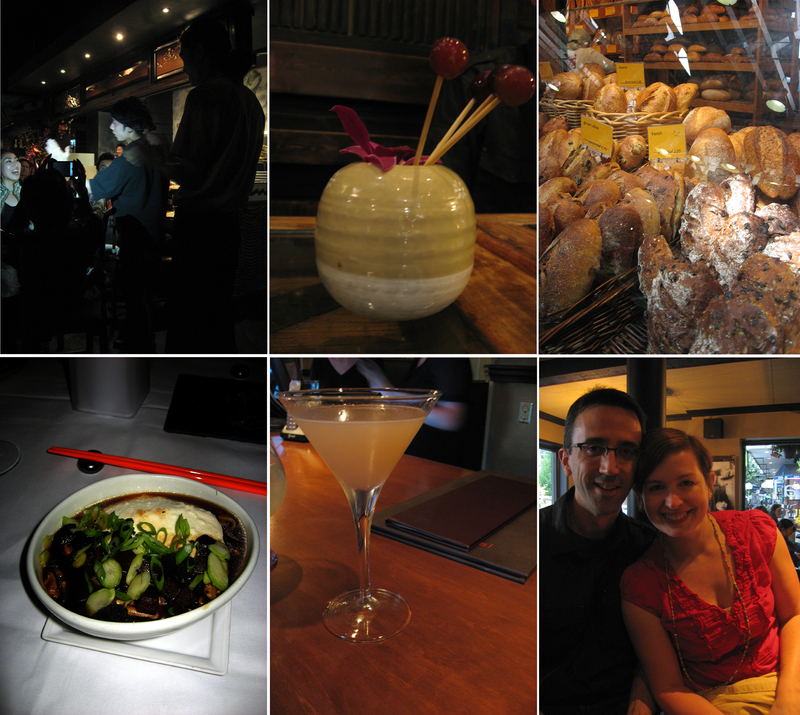 It was a beautiful day of relaxing, meandering, and meals. Apparently Shawn didn’t want the good feelings of the day to end, and after we bid goodnight to our buddies, he surprisingly had other plans for us in the “fancy bar” downstairs. Once I realized the drinks of choice that were ordered, champagne cocktails, I had a sneaking suspicion something serious was happening – but was utterly surprise to see Shawn down on one knee, and with a ring and everything! It was very sweet, and very Shawn – and quite natural to say “yes!” to. Some of you may know that we like to say “our relationship is Canadian” due to its beginnings on a fateful camping trip to Vancouver Island 6.5 years ago, so this seemed like a very fitting proposal. And so, it looks like I will be marrying my best friend…..
Before heading back down the road the next morning to Seattle and the phone calls to spread the news – there was meandering in the farmer’s market on Granville Island, a perennial favorite where a stop at Terra Breads is always a must (top collage, top right). The rustic pastries are always a great balance of sweet crispness, and the market is a perfect spot to stroll through for goodies to bring home. Thanks so much to Lori and Brian for their part in such a special trip!